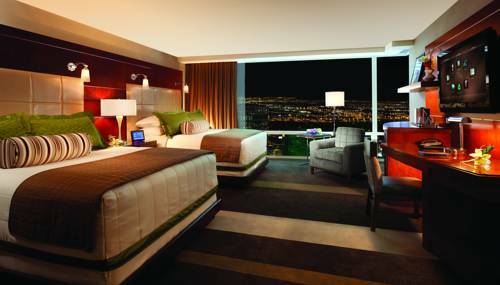 There is the Vegas you are used to, and then there is the AAA Five Diamondawarded ARIA Resort and Casino. Unsurpassed amenities from our world-class restaurants to the most technologically-advanced rooms and suites await you. Even our five-star service is unique, with every concierge trained in the art of tying a bow tie. Sip expertly crafted cocktails poolside by day, and at dinner let a Michelin chef do the cooking. After a night of revelry, countless indulgences await via the revolutionary in-room tablet where one-touch everything allows you to control lighting and curtains, order breakfast in bed, book a spa treatment and end the day with the tap of a goodnight button. From corner views in every room to signature experiences in Tower Suites and Sky Suites, ARIA is filled with wonders that will leave you counting the days until your next visit. This is how we Vegas. Maximum stay at property is 14 nights. The Buffet - Global Cuisine: Unbelievable selection of carefully prepared foods. BARDOT Brasserie - French Fine Dining: Classic French cuisine with a twist only Chef Michael Mina could bring. Jean Georges Steakhouse - Fine Dining: Michelin three-star Chef features the highest-quality meat and seafood. Carbone - Italian Fine Dining: Inspired by classic Italian-American flavors. Herringbone - California-Inspired Coastal Cuisine: Diners can enjoy California-inspired coastal cuisine. Blossom - Authentic Chinese Fine Dining: Chef Chi Kwun Choi has earned the Epicurean Award for Best Chinese Restaurant in Las Vegas. Sage - Creative American Fine Dining: James Beard Award-winning Chef Shawn McClain. Contemporary American Cuisine. Julian Serrano - Tapas-Spanish Fine Dining: Delectable interpretations of his native Spanish fare. Lemongrass - Thai Restaurant: Serving a modern interpretation of Thai cuisine. Five50 - Pizza Bar Casual: James Beard Award-winning Chef Shawn McClain spin on classic East Coast-style pizza. CATCH: The go-to dining destination for celebrities from Los Angeles to New York City, CATCH is the only location to bring epic renditions of Asian-influenced sushi, seafood and steak. ARIA Patisserie - Pastry Shop Casual: Nearly 15,000 pastries and decadent creations. Javier*s - Finest Foods of Mexico: Delivers a rich heritage of authentic Mexican Cuisine. Burger Lounge - Casual: A whole new approach to the classic American burger. ARIA Cafe - Open 24hrs: The largest 24-7 cafe in Las Vegas. American Cuisine. Pool Bar - ARIA Pool Bar: Find your drink of choice at our Pool Bar. Open seasonally to hotel guests only. Starbucks: Offers handcrafted beverages, premium teas and delectable treats. Pressed Juicery: 33 juice flavors and cleanses. ARIA is at the heart of ARIA Campus, which is a 67-acre urban resort destination located on The Strip on Las Vegas Blvd and less than three miles from McCarran International Airport - LAS. Fremont Street ExperienceOutdoor pedestrian promenade surrounded by 10 casino/hotels. A one-of-a-kind Light and Sound Show derived from over 2 million lights and 540,000 watts of concert quality sound, is presented each night hourly after dusk.